Download "SUPERIOR COURT OF THE STATE OF CALIFORNIA"
1 Paul L. Hoffman, CSB #1 Michael D. Seplow, CSB # 0 K. Arianne Jordan, CSB # 1 SCHONBRUN DeSIMONE SEPLOW HARRIS & HOFFMAN LLP Ocean Front Walk Venice, California 01 Telephone: ( -01 Fax: ( -00 Gloria Allred, CSB # 0 Michael Maroko, CSB # ALLRED, MAROKO & GOLDBERG 00 Wilshire Boulevard, Suite 00 Los Angeles, California 00 Telephone: ( -0 Fax: ( -0 Attorneys for Plaintiff Rhonda Miller SUPERIOR COURT OF THE STATE OF CALIFORNIA FOR THE COUNTY OF LOS ANGELES RHONDA MILLER, vs. Plaintiff, ARNOLD SCHWARZENEGGER, SEAN WALSH, CALIFORNIA FOR SCHWARZENEGGER CAMPAIGN and DOES 1 through 0, inclusive, Defendants. CASE NO. COMPLAINT FOR LIBEL DEMAND FOR JURY TRIAL 1. 2 Plaintiff Rhonda Miller ("plaintiff" or "Ms Miller", on information and belief, alleges as follows. GENERAL ALLEGATIONS 1. This is an action for damages based upon a calculated act of character assasination conducted by Arnold Schwarzenegger, his press secretary, Sean Walsh and his campaign organization against plaintiff Rhonda Miller, a woman who had the courage to come forward to bear witness to Schwarzenegger's outrageous acts of sexual harassment on the set of "Terminator-".. On October, 0, Rhonda Miller held a press conference at the law offices of attorney Gloria Allred in Los Angeles. At this press conference Ms. Miller made a statement concerning Arnold Schwarzenegger's improper and unlawful conduct on the set of "Terminator-." A true and correct copy of the statement made by Ms Miller is set forth as Exhibit "A" to this complaint.. On information and belief, less than an hour after the press conference was completed, defendents disseminated to dozens, if not hundreds, of media outlets and reporters and editors an e- mail informing them that plaintiff Rhonda Miller was a felon with a long criminal record. Defendants did this by telling the media to log on to the Los Angeles Superior Court website, to go to the index of criminal defendants, and to type in "Rhonda" and then "Miller" on the site. After doing this the media would know about Rhonda Miller's background. Indeed, the chastises Ms Allred by stating: "We have to believe that as a lawyer, Gloria would have thoroughly checked the facts and background of the individual she presented at a news conference today." In other words, had Ms. Allred logged on to the same site she would have learned that plaintiff Rhonda Miller had a long criminal record with many felony convictions, including convictions for fraud and prostitution. A true and correct copy of the e mail disseminated by defendants on October, 0, is attached as Exhibit "B" to this complaint. Attached as Exhibit "C" is a true and correct copy of the materials the media would have obtained by following the instructions set forth in exhibit "B.". Defendants knew that plaintiff Rhonda Miller is not the same Rhonda Miller as the person or persons identified in any of the filings on the Los Angeles Superior Court website, nor did they have any reason for believing that plaintiff has a criminal record of any kind,. Plaintiff Miller. 3 has never been charged with or convicted of any crime, much less the convictions in the Los Angeles Superior Court data base. 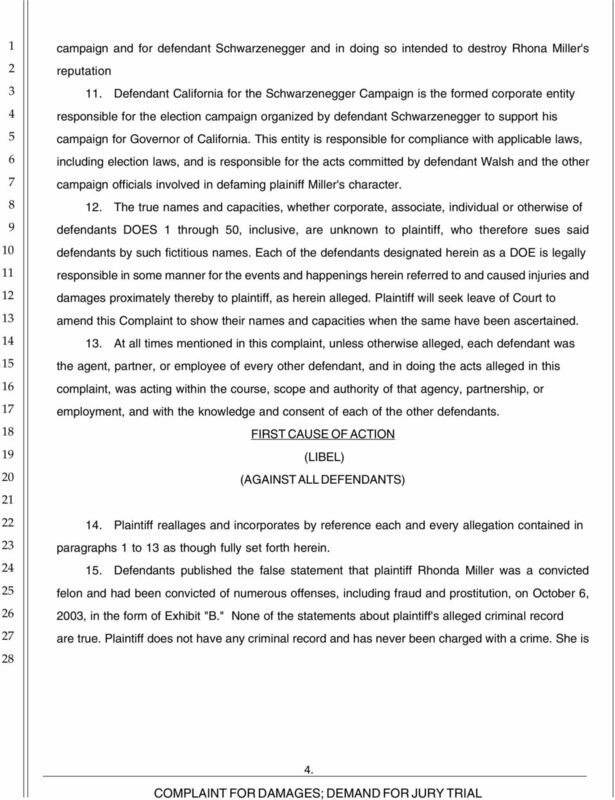 Nonetheless, defendants published the false and defamatory with the intent to harm plaintiff's reputation so that the public would be less likely to believe her statement regarding Schwarzenegger's sexually offensive conduct.. Because of the intense local, statewide, national, and even international media and public interest in the October, 0, recall election, the false statements in Exhibit "B" had an enormous circulation throughout the world in print, radio, television, and internet media. This widespread dissemination of these utterly false statements has caused and will continue to cause Ms. Miller enormous financial and emotional damages and have placed an indelible stain on her previously excellent reputation. JURISDICTION AND VENUE. The Court has personal jurisdiction over the defendants because they are residents of and/or doing business in the State of California.. Venue is proper in this county in accordance with Section (a of the California code of Civil Procedure because the defendants, or some of them, reside in this county, and the injuries alleged herein occurred in this county. PARTIES. Plaintiff Rhonda Miller is an individual who, at all relevant times during the events alleged herein, resided in the County of Los Angeles.. Defendant Arnold Schwarzenegger at all times relevant hereto was and is a resident of the County of Los Angeles. He is the Governor of the state of California. On information and belief, Mr. Swarzenegger was in direct control of the actions taken on his behalf by his campaign managers, including Mr. Walsh, and was aware of this act of character assassination before it was conducted. Mr. Schwarzenegger, when confronted with the news of this outrageous action,. did not disown it and indeed ratified these actions by his inaction in the face of these actions and thus adopted them as his own acts.. 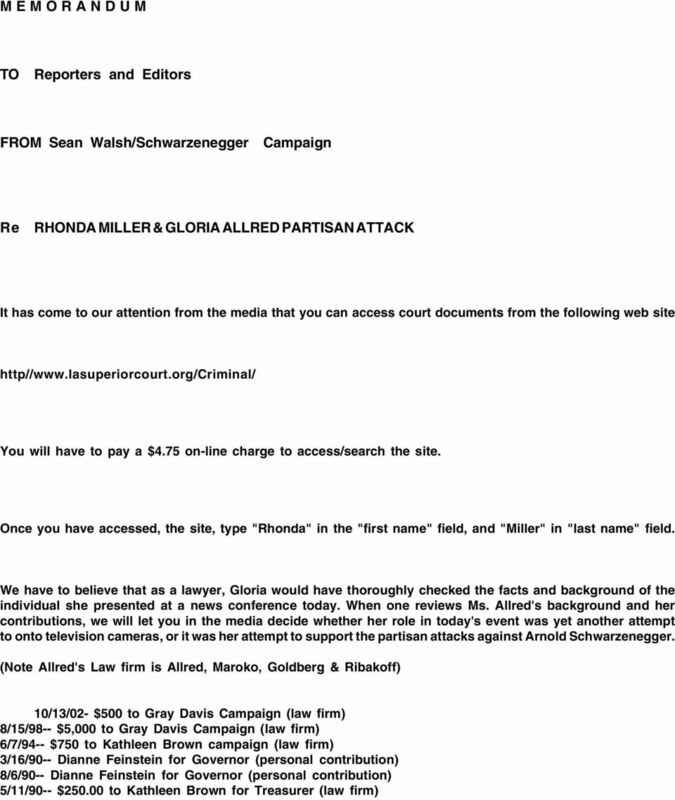 Defendant Sean Walsh was a leading campaign official working for defendant Schwazenegger. Defendant Walsh disseminated Exhibit "B" while acting as an agent for the. 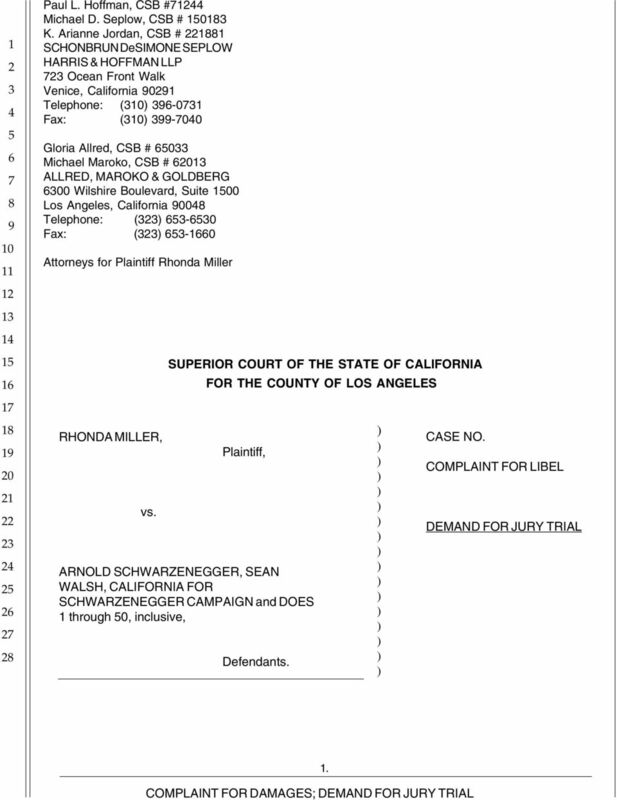 4 campaign and for defendant Schwarzenegger and in doing so intended to destroy Rhona Miller's reputation. Defendant California for the Schwarzenegger Campaign is the formed corporate entity responsible for the election campaign organized by defendant Schwarzenegger to support his campaign for Governor of California. This entity is responsible for compliance with applicable laws, including election laws, and is responsible for the acts committed by defendant Walsh and the other campaign officials involved in defaming plainiff Miller's character.. The true names and capacities, whether corporate, associate, individual or otherwise of defendants DOES 1 through 0, inclusive, are unknown to plaintiff, who therefore sues said defendants by such fictitious names. Each of the defendants designated herein as a DOE is legally responsible in some manner for the events and happenings herein referred to and caused injuries and damages proximately thereby to plaintiff, as herein alleged. Plaintiff will seek leave of Court to amend this Complaint to show their names and capacities when the same have been ascertained.. At all times mentioned in this complaint, unless otherwise alleged, each defendant was the agent, partner, or employee of every other defendant, and in doing the acts alleged in this complaint, was acting within the course, scope and authority of that agency, partnership, or employment, and with the knowledge and consent of each of the other defendants. FIRST CAUSE OF ACTION (LIBEL (AGAINST ALL DEFENDANTS. Plaintiff reallages and incorporates by reference each and every allegation contained in paragraphs 1 to as though fully set forth herein.. Defendants published the false statement that plaintiff Rhonda Miller was a convicted felon and had been convicted of numerous offenses, including fraud and prostitution, on October, 0, in the form of Exhibit "B." None of the statements about plaintiff's alleged criminal record are true. Plaintiff does not have any criminal record and has never been charged with a crime. She is. 5 not the Rhonda Miller identified in any of the legal pleadings in the Los Angles Superior Court data base referred to in Exhibit "B" hereto.. Defendants published these false and defamatory statements with constitutional malice in that defendants knew that the statements were false, or acted with reckless disregard for the truth of these statements. Defendants knew who the real Rhonda Miller was and could not reasonable have believed that she was the same Rhonda Miller as the Rhonda Millers in the Los Angeles Superior Court data base they led reporters to.. PLaintiff is entitled to general damages for her loss of reputation, shame, mortification, hurt feelings, and emotional distress in accordance with proof at trial.. Plaintiff is entitled to special damages for the damage done to her property, business, trade, profession, or occupation, including amounts of money plaintiff expended as a result of the defendants' defamatory statements and assertions. In particular, these false and defamatory statements will make it very difficult for plaintiff to obtain work on future motion pictures.. As a direct result of defendants' wrongful acts, plaintiff has suffered emotional distress and other damage and has suffered an indelible mark on her reputation in an amount to be proven at trial.. Defendants acted with reckless, willful or callous disregard for plaintiff's rights and with malice, fraud or oppression toward plaintiff, thereby entitling plaintiff to an award of punitive damages in accordance with proof at trial..
6 PRAYER FOR RELIEF WHEREFORE, plaintiff requests judgment against defendants as follows. 1. For general damages according to proof;. For special damages according to proof;. For exemplary and/or punitive damages;. For plaintiff's cost of suit; and. For such other relief as the court may deem just and proper. 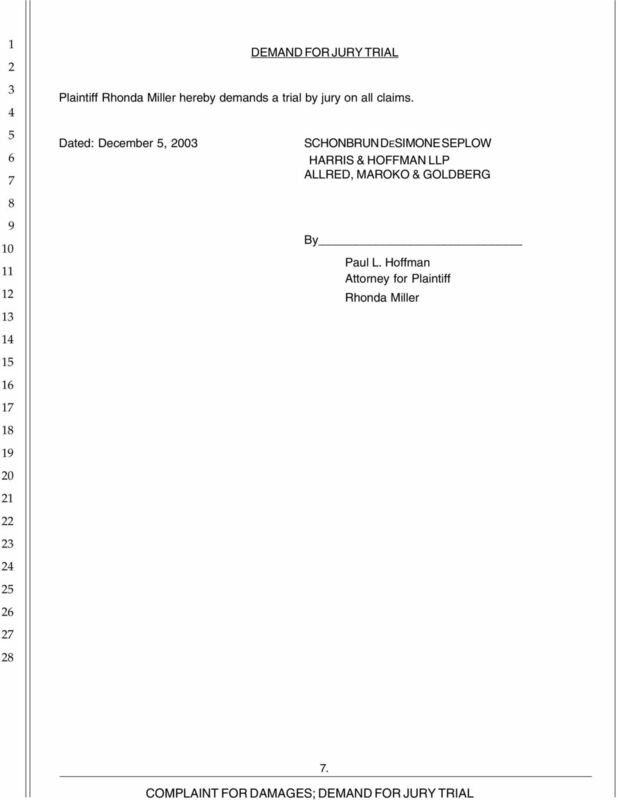 Dated December, 0 SCHONBRUN DESIMONE SEPLOW By HARRIS & HOFFMAN LLP ALLRED, MAROKO & GOLDBERG Paul L. Hoffman Attorney for Plaintiff Rhonda Miller. 7 DEMAND FOR JURY TRIAL Plaintiff Rhonda Miller hereby demands a trial by jury on all claims. 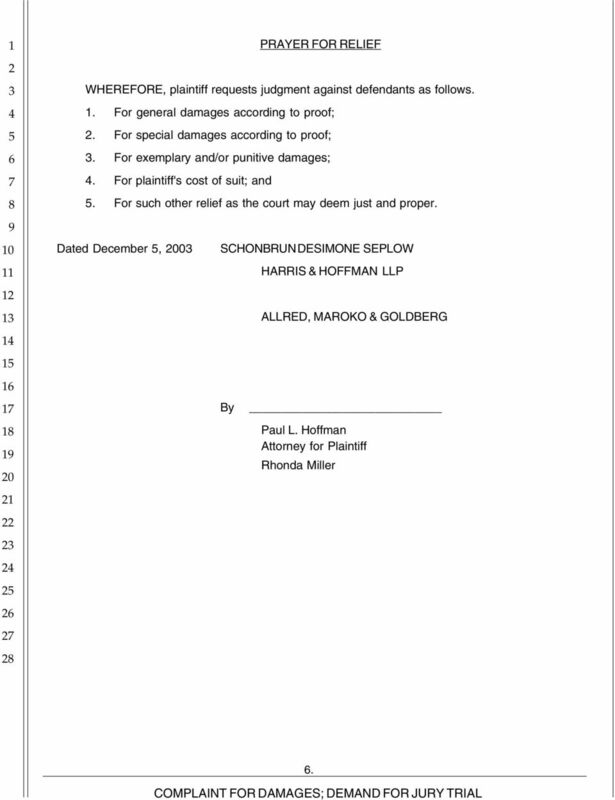 Dated: December, 0 SCHONBRUN DESIMONE SEPLOW HARRIS & HOFFMAN LLP ALLRED, MAROKO & GOLDBERG By Paul L. Hoffman Attorney for Plaintiff Rhonda Miller. 8 M E M O R A N D U M TO Reporters and Editors FROM Sean Walsh/Schwarzenegger Campaign Re RHONDA MILLER & GLORIA ALLRED PARTISAN ATTACK It has come to our attention from the media that you can access court documents from the following web site http// You will have to pay a $. on-line charge to access/search the site. Once you have accessed, the site, type "Rhonda" in the "first name" field, and "Miller" in "last name" field. We have to believe that as a lawyer, Gloria would have thoroughly checked the facts and background of the individual she presented at a news conference today. When one reviews Ms. Allred's background and her contributions, we will let you in the media decide whether her role in today's event was yet another attempt to onto television cameras, or it was her attempt to support the partisan attacks against Arnold Schwarzenegger. (Note Allred's Law firm is Allred, Maroko, Goldberg & Ribakoff //0- $00 to Gray Davis Campaign (law firm //-- $,000 to Gray Davis Campaign (law firm //-- $0 to Kathleen Brown campaign (law firm //0-- Dianne Feinstein for Governor (personal contribution //0-- Dianne Feinstein for Governor (personal contribution //0-- $0.00 to Kathleen Brown for Treasurer (law firm. IN THE CIRCUIT COURT OF THE SEVENTEENTH JUDICIAL CIRCUIT, IN AND FOR BROWARD COUNTY, FLORIDA CASE NO. : BRADLEY J. EDWARDS and PAUL G.
Attorneys for Plaintiff People of the State of California FOR THE COUNTY OF ORANGE. Defendants. UNITED STATES DISTRICT COURT FOR THE EASTERN DISTRICT OF TEXAS SHERMAN DIVISION McAFEE, INC. v. Plaintiff, WILMER, CUTLER, PICKERING, HALE AND DORR, L.L.P JURY REQUESTED No. 4:08-cv-160 MHS-DDB Defendant. SUPERIOR COURT OF THE STATE OF CALIFORNIA FOR THE COUNTY OF MONTEREY. No. SUPERIOR COURT OF THE STATE OF CALIFORNIA FOR THE COUNTY OF SAN DIEGO - CENTRAL DIVISION. Plaintifl. Defendants. 1 1 1 1 1 0 1 Luke L. Dauchot (SBN Nimalka R. Wickramasekera (SBN Benjamin A. Herbert (SBN South Hope Street Los Angeles, California 001 Telephone: (1 0-00 Facsimile: (1 0-00 Attorneys for Plaintiff, v.
Case: 1:15-cv-09957 Document #: 1 Filed: 11/04/15 Page 1 of 10 PageID #:1 JACLYN PAZERA Plaintiff, IN THE UNITED STATES DISTRICT COURT FOR THE NORTHERN DISTRICT OF ILLINOIS EASTERN DIVISION v. Case No. IN THE SUPERIOR COURT OF THE STATE OF ARIZONA IN AND FOR THE COUNTY OF MARICOPA. No. UNITED STATES DISTRICT COURT DISTRICT OF DELAWARE DERMAFOCUS LLC, a Delaware limited liability company, v. Plaintiff, ULTHERA, INC., a Delaware corporation. Civil Action No: DEMAND FOR JURY TRIAL Defendant.